Basil Champneys was Newnham’s architect from 1873 to 1913. During that period, the College grew from the original building “Newnham Hall” to a total of six major buildings, plus the Laboratory and the Yates Thompson Library. Old Hall was the first building completed by Basil Champney in 1875. 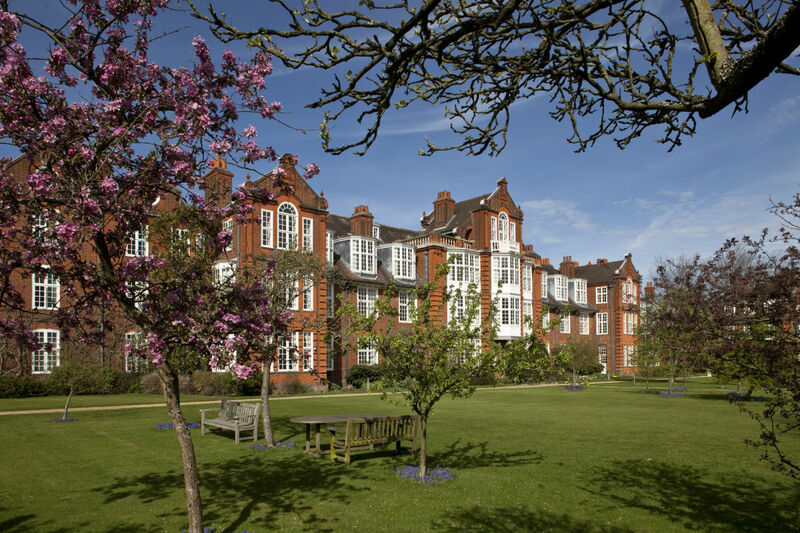 The building was first known as Newnham Hall, known later as South Hall, and now as Old Hall, was opened in 1875 when Miss Clough came into residence with Miss Paley as the first resident lecturer. This building in its turn was quickly outgrown and by 1879 it was felt that the time had come to amalgamate the association and the company in a new society which would co-ordinate the work of teaching and housing the students. Pfeiffer Arch was completed in 1893, 18 years after Old Hall. This is because it was not until 1892, and some years of hard negotiation that the Sidgwicks had persuaded the local authorities to close the lane which ran on from the end of Newnham Walk at the Pightle down to Grange Road. Instead Sidgwick Avenue was built. This was a crucial development for the College. 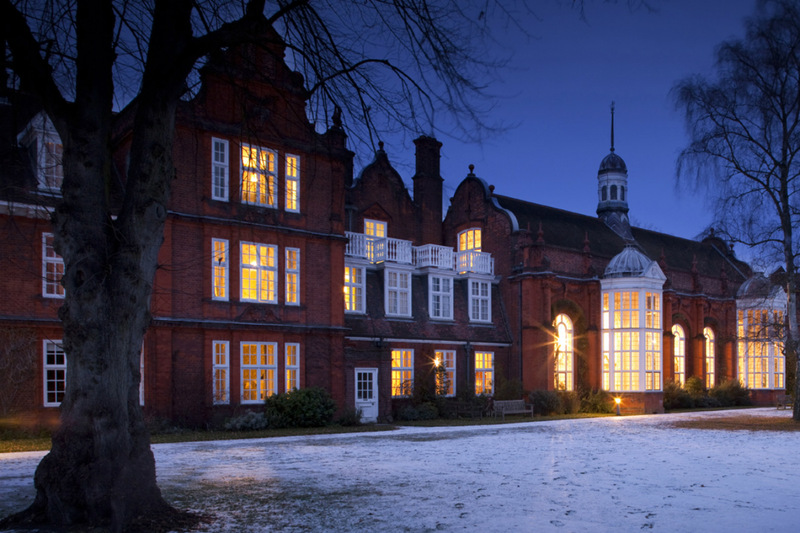 Sidgwick Hall – originally called ‘North Hall’ – was the College’s second building. 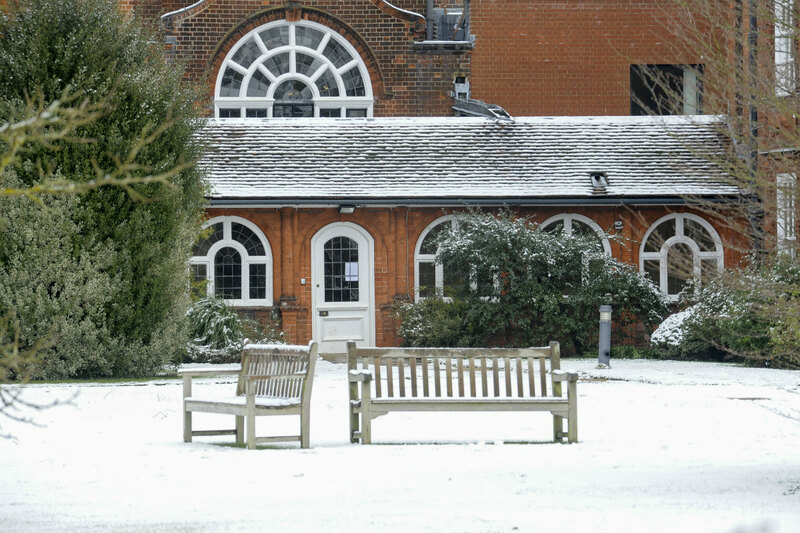 When it was built, in 1880, it was divided from the rest of the College by Newnham Lane, the continuation of Newnham Walk through to Grange Road. After Newnham negotiated the closure of the lane (and its replacement by Sidgwick Avenue, to the north of the building), the two parts of the College were united. Clough Hall was built in 1886. 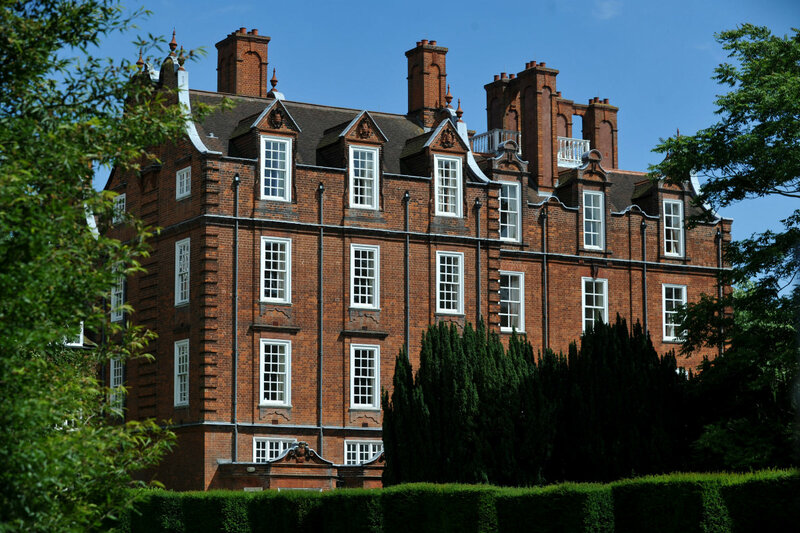 After Newnham College was incorporated as an association not for profit in June 1880, the College went ahead with building the splendid Clough Hall and its fine Dining Hall. The Kennedy building was built in 1906, to accommodate the growing number of academic staff, and so unlike the other main buildings, does not have its own dining hall (students dined in their own building until the early sixties, presided over originally by the Vice-Principal for their own hall, and later on by the Tutor for their own hall).  Its name commemorates Marion Kennedy (1836-1914), who had been honorary Secretary of the College from 1880 until 1904. Last of all the Champneys buildings is Peile, completed in 1910. Peile Hall commemorated the work which Dr. Peile, Master of Christ’s College, and his wife had done for Newnham. He was President of the College from 1890 to 1909 and Mrs. Peile organized the correspondence classes which helped many women unable to come up to Cambridge. The original Yates Thompson Library was built in 1897 and extended in 1907. 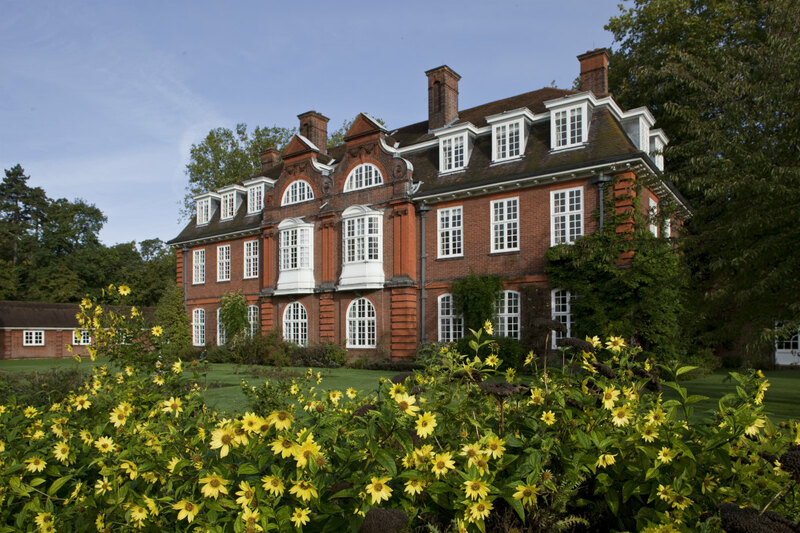 All buildings designed by Champneys are in the so-called “Queen Anne” style, with lots of red brick, white-painted sash windows, curly pedimented gables, steep roofs and curving bay windows. 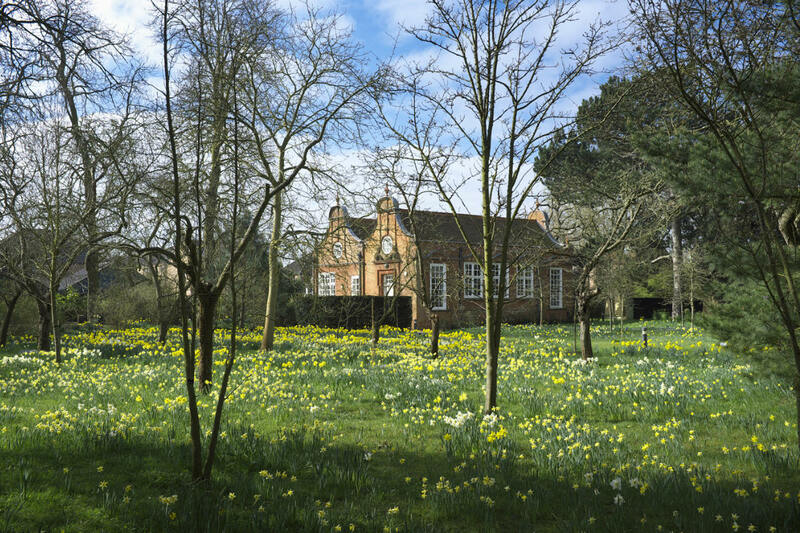 The gardens […] lay before me in the spring twilight, wild and open, and in the long grass, sprinkled and carelessly flung, were daffodils and bluebells, not orderly perhaps at the best of times, and now wind-blown and waving as they tugged at their roots. The windows of the building, curved like ships’ windows among generous waves of red brick, changed from lemon to silver under the flight of the quick spring clouds. 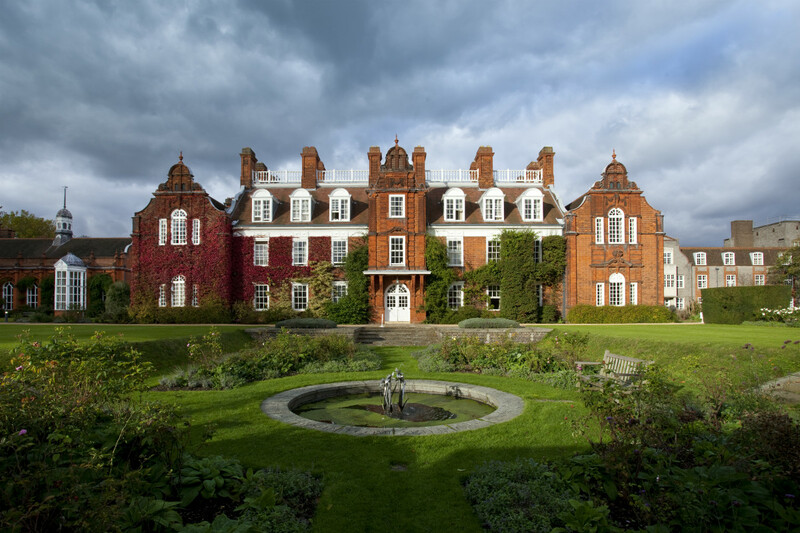 Newnham College was in the unusual and fortunate position to have had a College architect, Basil Champneys, from the first building on the site in 1875 – ‘Newnham Hall’, now known as Old Hall – to the completion of Peile Hall in 1910. Subsequent distinguished architects have relished the chance to respond to Champney’s designs. A number of the buildings, both Victorian and modern, are now Grade II* and Grade II Listed. 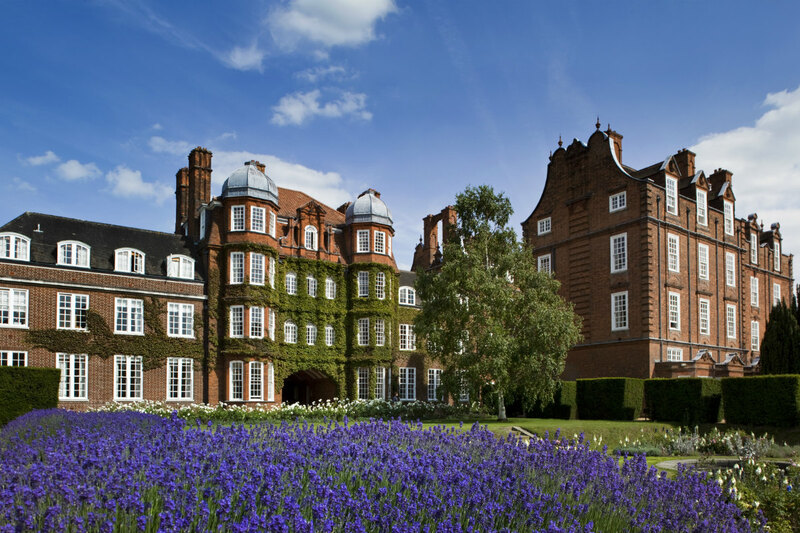 Champneys’ work established the precedent for high quality buildings with positive relationships with their landscape context and set the scene for the character of the College today.